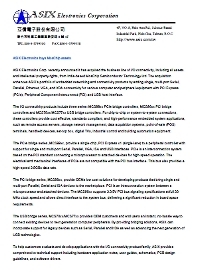 As an Asix Electronics distributor, NAC supplies Asix's full line up of Ethernet controllers, single chip micro-controllers, high speed USB to LAN, and embedded network SoC. 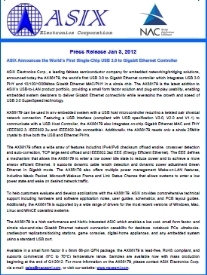 ASIX Electronics Corporation is a leading fabless semiconductor supplier with focus on networking, communication and connectivity applications. ASIX was founded in May 1995 in Hsinchu Science Park, Taiwan. ASIX's customers include those companies with premium brand name in the networking and communication industries. ASIX works closely with the leaders in the networking industry to provide highly integrated solution for customer applications. ASIX has been certified as an ISO 9001 and 14001 suppliers. This achievement represents our continuing commitment to maintain a world-class quality system.